MagnaFlow Diesel Exhaust - MagnaFlow Series - Dezod Motorsports Inc - Home of the automotive performance enthusiast since 2002. 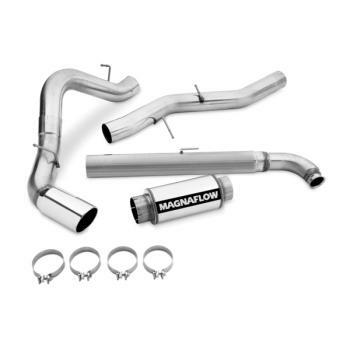 MagnaFlow Series Diesel Systems are the premium line featuring giant, fast-flowing, 4” mandrel-bent stainless steel tubing, and a polished 5” diameter stainless steel double wall tip. MagnaFlow Series Diesel Systems incorporate mirror finished MagnaFlow Performance Mufflers with a straight-through design. Offered in a “turbo-back” or “cat-back”, all of our systems are proven to make significant gains in power. All systems include a stainless steel, straight-through wide open performance muffler, 100% stainless steel tubing, and all the necessary hardware to complete the job like a pro.